I can’t take my eyes off this salad! The concept came to me as I was improvising a big green salad for Friendsgiving this year. Salads are often overlooked at the holidays, so I set out to make a festive red-and-green showstopper. I knew I wanted to incorporate ruby-red pomegranate arils and fresh pear, since they’re both so delicious this time of year. I added Honeycrisp apple, goat cheese and pecans for good measure. To make the dressing taste festive and cut through the sweetness of the fruit, I added fresh ginger to my basic apple cider vinaigrette. Believe me, this salad tastes as good as it looks. This salad might look fancy, but it’s simple to put together. You’ll want to pay extra attention to how you prepare the ingredients, so I’ve typed up some tips below. 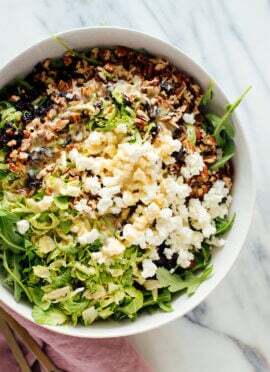 If you’re craving some greens to get you through the holidays, or already working on your holiday menu, this salad is for you! Apple and pear: Slice straight down about 1/2″ from the core. Repeat on the remaining three sides, and discard the core. With the flat sides lying flat against the cutting board, cut them into very thin slices, keeping the pieces together as best you can. Then, fan out the slices into sections and place them around the salad as shown. Pomegranate: There are a bunch of different ways to remove the arils from a pomegranate, but I usually do it like this. Goat cheese: You can easily crumble cold goat cheese with a fork into a bowl. You’ll need half of a standard log of goat cheese for this recipe. Pecans: Freshly toasted nuts offer tons of flavor, so that’s why I recommend buying raw nuts and toasting them as needed. It’s a simple step that makes a big difference, and your nuts will stay fresher longer this way. Dressing: Simply whisk it all together! You can make the dressing a day or two in advance, if you’d like. To serve: This salad really makes a statement when it’s spread across a big serving platter like mine (affiliate link). I usually recommend tossing your salad before serving, but this one is prettier if you simply drizzle dressing lightly all over it and let guests take their portions from there. Please let me know how this salad turns out for you in the comments! I hope it makes an appearance at your holiday table, if not sooner. 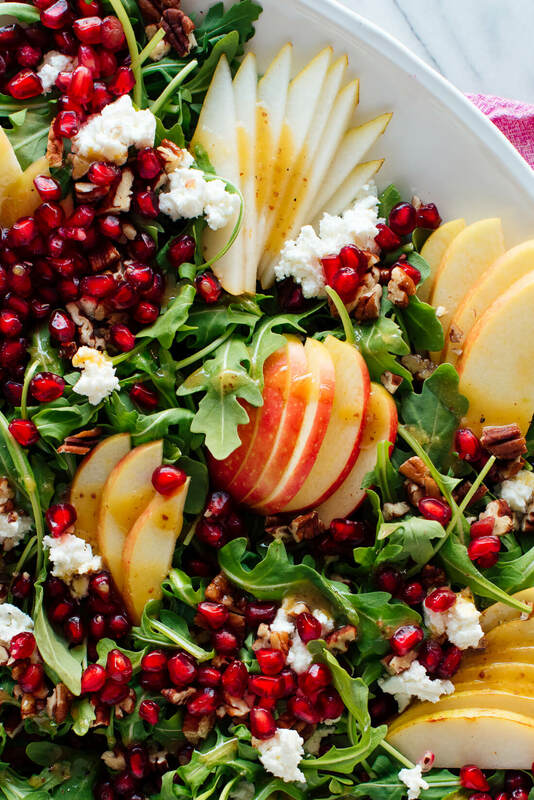 This gorgeous green salad recipe is bursting with fresh pomegranate, Bartlett pear and Honeycrisp apple! 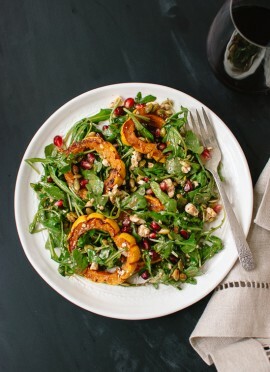 This salad will brighten up your holiday table, and liven up a regular weeknight dinner. Recipe yields 4 to 6 side salads. To toast the pecans, place them in a skillet over medium heat. Toast, stirring often, until they’re fragrant and starting to turn golden on the edges, about 4 to 5 minutes. Remove the pecans from the heat and roughly chop them (no need to chop if you started with pecan pieces). Set aside. 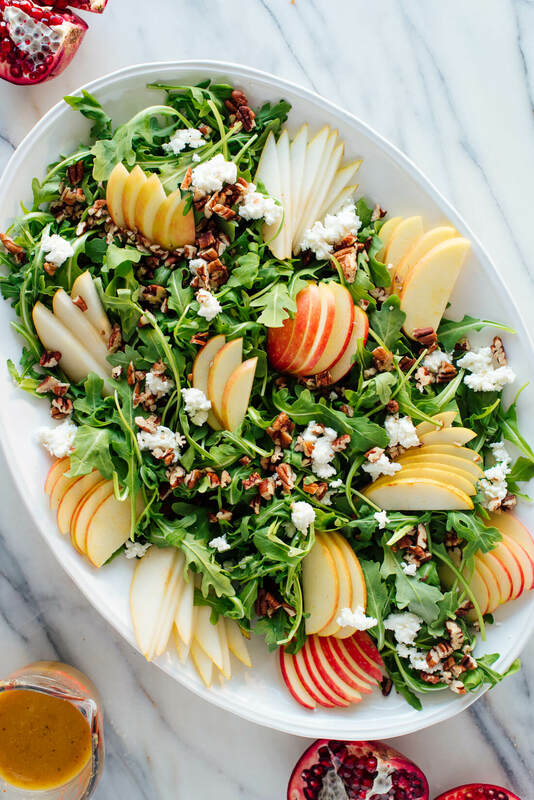 Arrange the arugula across a large serving platter (or bowl, but the salad looks prettiest on a platter). Sprinkle the chopped pecans and crumbled goat cheese over the arugula. 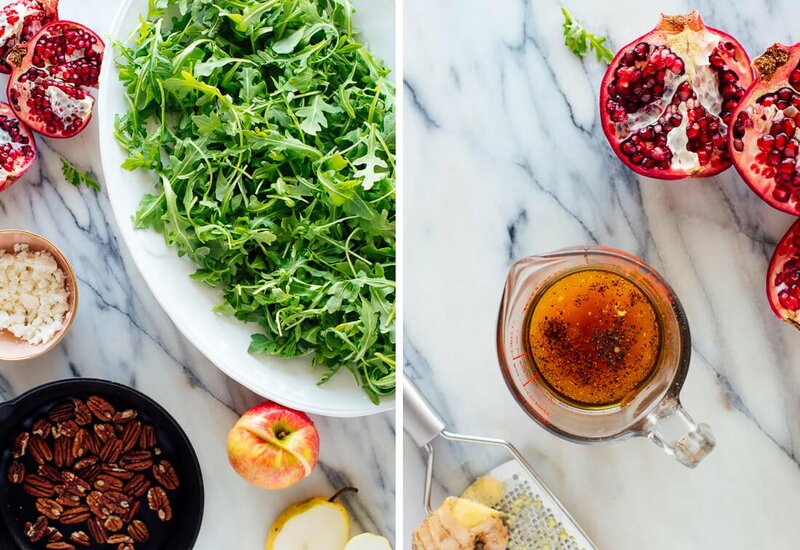 Fan out your slices of pear and apple and arrange them across the salad in sections (see photos). Sprinkle all over with fresh pomegranate arils. To prepare the dressing, combine all of the ingredients and whisk until blended. Taste, and if it isn’t quite zippy enough, add another teaspoon of vinegar. Wait to dress the salad until you’re ready to serve (the dressing will wilt the greens over time). When you’re ready, drizzle the ginger dressing lightly all over the salad (you might not need all of it). Serve promptly. Dressing adapted from the liquid gold salad dressing in my cookbook, Love Real Food. Make it dairy free/vegan: Simply omit the goat cheese. Vegans, be sure to use maple syrup instead of honey. Make it nut free: Substitute pepitas (green pumpkin seeds) for the pecans. 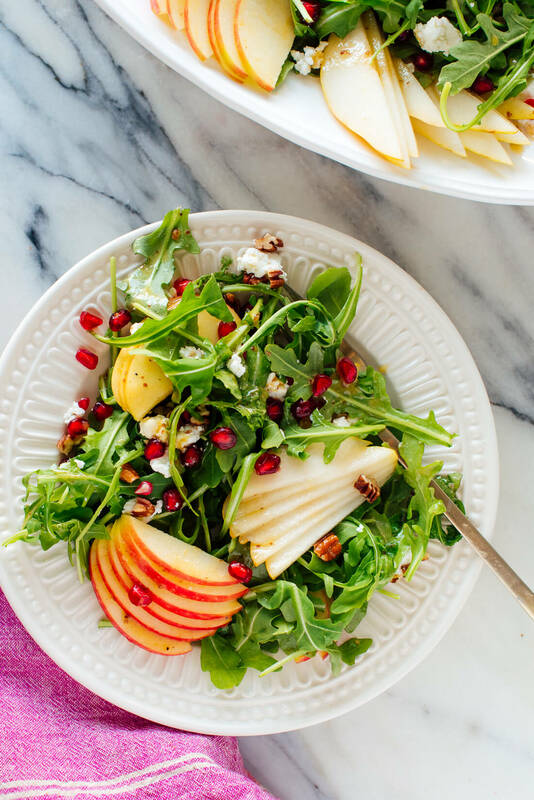 Prepare in advance: You could prepare the salad dressing, and arrange the arugula, pecans, goat cheese and pomegranate up to 1 day in advance. Cover and chill in the refrigerator. Slice and arrange the apple and pear just before serving, since they turn brown over time. Storage suggestions: This salad is best served promptly. If you know you’ll have leftovers, dress individual servings as needed and store the salad and dressing separately. Leftover dressing will keep well in the refrigerator for 1 week. Lucky me! I received your cookbook as a birthday present. I’ve been a long time subscriber to the blog. I look forward to experimenting with some more of these dishes. Happy Birthday to you! What a great gift. :) Let me know what you think of it and your favorite recipe as you start trying them out! This salad looks so great! The pomegranates we get in New Zealand are imported and they arrive in our spring/summer, so I might switch the pear for something a bit more seasonal here. 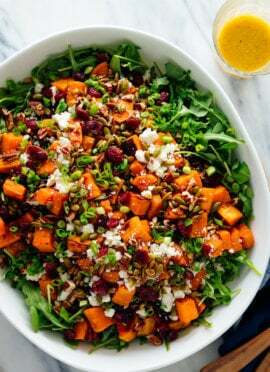 Salad is perfect for our current weather, although I also love the idea of lightening a heavy winter celebration meal with one. I’ve never found a perfect way to remove arils, so I just put on an apron and let the squirts go where they may:). Let me know what you try out! Yes, pomegranates can be messy. This salad will definitely be added to my Christmas dinner. Love the colors and the flavors you combined. Thanks. Wonderful! Let me know what you think. Kate, this is stunning! Thank you!! You’re welcome! Let me know what you think, Corinne! Prettiest salad I’ve ever seen and the flavors sound like they will be amazing together. Thank you for this inspired salad recipe! You’re welcome! It seriously is so pretty, and delicious! This looks great! We are going to try it. But for those who are not enamored of goat cheese, what would you suggest as a substitute? Hi Toby! You could omit if you like, use feta. That would be nice too! This salad is beautiful. Can’t wait to try it. This looks great!! Definitely trying it tonight. Would it be ok to substitute goat cheese with Feta? Or will it change the concept of the salad? Feta would be lovely, too! This salad looks amazing. Making it for ladies luncheon. Great salad option for a luncheon! Let me know what the ladies think. Oh man, I bought a pomegranate and an asian pear on my last grocery trip and have a nub of ginger floating around my crisper drawer, so I feel an immediate need to pick up some greens and make this happen! I know asian pears have a different flavor than regular pears but in the interest of using what I have I bet that could be a good sub for both the apple and bartlett here! (Plus I’ve been having bad luck with regular pears ripening lately….) Can’t wait to try this! Asian Pears are delicious and I’m sure they would pair nicely. I bet that will still be lovely! Let me know what you think, Lilian! I love salads, this one is definitely adding to my holiday salad lists. thanks for the inspiration. You’re welcome! Let me know what you think when you try it! The minute I saw this recipe, I ordered your cookbook! 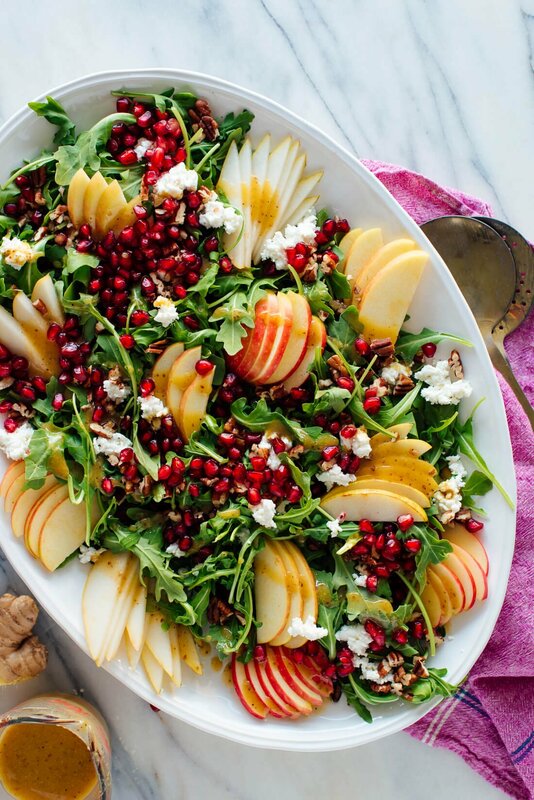 I can’t wait to make this “pretty” salad for the holidays! It is absolutely gorgeous. Received your cookbook yesterday from Amazon … WOW … I collect cookbooks … can’t say that I always make everything. Read some of the reviews for yours … I guess you walk on water. 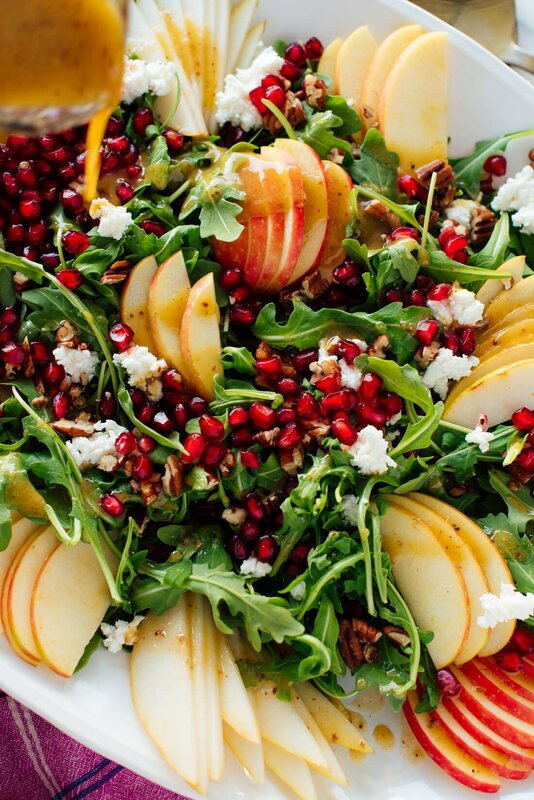 This pomegranate salad is not only the prettiest salad I’ve made but also the best tasting. The pomegranate seeds give it added sweet tartness and crunch, and the ginger dressing is amazing! Definitely my new company/holiday go-to salad! I made this today for a ladies luncheon and it was a hit. I did need to add 2 tsp cider vinegar to give it a bit of extra zip (I made the dressing yesterday and it lost a bit of flavour). I had many requests for the recipe and definitely plan to make it again down the road. A great salad for a luncheon! Thanks for sharing, Kim. I’m glad it was a hit! I made the salad tonight and it was delicious , light and flavorful. I used lemon juice as I did not have apple vinegar with me. Love the dressing ! Kate, I love your salads! And this is another amazing one. Made it for our Christmas Eve dinner. It’s a feast for the eyes & packed full of delicious flavors. I’m so glad! Thanks, Mary. I still can’t get over this one. Delicious and beautiful! beautiful and delicious – thank you!!! You’re welcome, Sue! Thanks for your review. Was the star of the show at Christmas dinner. So beautiful and very tasty. I added lemon juice to the dressing to make it zingy. Your recipes are so lovely. Thank you so much and Happy New Year! This salad really is a star. I’m glad you loved it! This was the best looking salad I’ve ever made, and the taste lived up to the appearance. I loved how bright and fresh it was, and the ginger dressing added just the right amount of zing and pulled everything together. This was literally the centerpiece of my Christmas dinner table, and everyone loved it! Thank you, Josh for your comment! I made this to serve with Christmas dinner. Not only delicious, but so beautiful my daughter in law took a photo of it and posted on her FB page! Love the look of this recipe & cant wait to try it. Can you also please try to include some kid friendly recipes? I love all your recipes but have a hard time convincing my girls to try them as they are not adventurous eaters. This is the only thing missing from your blog for me. Thank you! It was delicious. So attractive to look at as well. Easy to make. I served this salad on Christmas Eve and it was a huge hit! Festive looking and delicious while packing in lots of flavor and nutrition. My foodie relatives loved it and I will keep it on the menu for sure. This salad looks absolutely stunning! This salad is as pretty as it is tasty! We made it for a family Christmas meal and liked it so much we made it again the next week. Fresh ginger in the dressing really gave it a nice touch. I love it! The ginger is a game changer for sure. Thanks for the review, Janine! I made this for a dinner party and my guests absolutely raved about it- everyone wanted to know what was in the dressing! I plan on making it again for my next party. Thanks for another spot-on recipe! This salad was so good! I was looking forward to it all week as I was waiting for my pear to ripen. Well worth the wait! And the dressing paired perfectly with it. Definitely added that extra tablespoon of apple cider vinegar. Perfect amount of “zippy.” I’ve rediscovered your website and have so far loved everything I’ve made. Thanks for sharing with us! I’m glad it was worth the wait! It’s so so delicious. Thank you, Caroline! O my goodness… this is such a delicious salad! I brought this to a Christmas potluck and it was a bit hit! Everyone wanted the recipe! Thanks again! I was not able to find pomegranate seeds, so I substituted fresh blueberries. I also used a mix of baby greens (arugula, tat soi, Swiss chard, spinach and pea shoots). It was absolutely delicious! I love the ginger dressing! Thank you for sharing! Sounds like a great salad, Sandi. I needed more ginger, so I peeled a huge piece of ginger (at least six inches) and put in the food processor. I added 1/4 c olive oil and 1 Tbsp olive oil, tasted, and repeated until I got the right consistency. I added 1-2 tsp dijon mustard and salt and pepper to taste. It’s my new food addiction! Delicious and easy to make!!! Thanks for the review and trying it!